Now I know why so many people love Malice Domestic, the annual convention celebrating the traditional mystery. From start to finish, a terrific con — and yes, I thought that even before the Agatha Awards! I was truly stunned to win. With such an amazing group of nominees — Charlaine Harris, AB (Barbara) Emrys, John Curran, and Michael Dirda — I’m deeply honored. A big thanks to everyone who’s read, bought, reviewed, and talked about Books, Crooks & Counselors. Your support means the world to me. Come on by, and I’ll pour you a cup of tea from a very special pot. 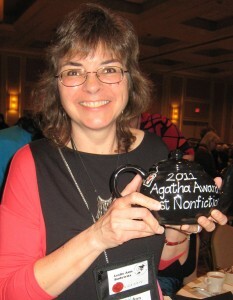 This entry was posted in Books Crooks and Counselors and tagged Agatha awards, Malice Domestic by Leslie Budewitz. Bookmark the permalink. Thanks, Theresa! It’s sinking in… . Thanks, Brin! Loved your pictures from Paris — they allowed me to imagine I was back there! Oh that is so nice. Big congratulations and may it be the first of many for you. Thanks, Kathy! I’m still stunned — and still smiling!